This month, we take you to the Gaillac region which sits to the north of Mazamet and is a lovely drive via Lautrec and the rolling countryside which is dotted with both vineyards & fields of sunflowers. The AOC of Gaillac is one of the oldest wine regions of the ancient region of Gaul (an area of Western Europe that stretched from Italy to Spain and as far north as the Netherlands). Gaillac itself has a history of viniculture stretching back over 2000 years when vines were planted by the Phoenicians in the 4th century BC. Gaillac is strategically located and the wines could be transports in earthenware pots made in the nearby village of Montans and transported on the River Tarn and onto the Garonne which linked to Bordeaux. The Gaillac AOC, today, has 13 grape varieties (8 red and 5 white) that can be officially grown and used in Gaillac wines – in addition to everyday names like Syrah and Sauvignon, more unusual varietals like Duras, Prunelart, Loin de L’Oeil and Ondenc are grown. 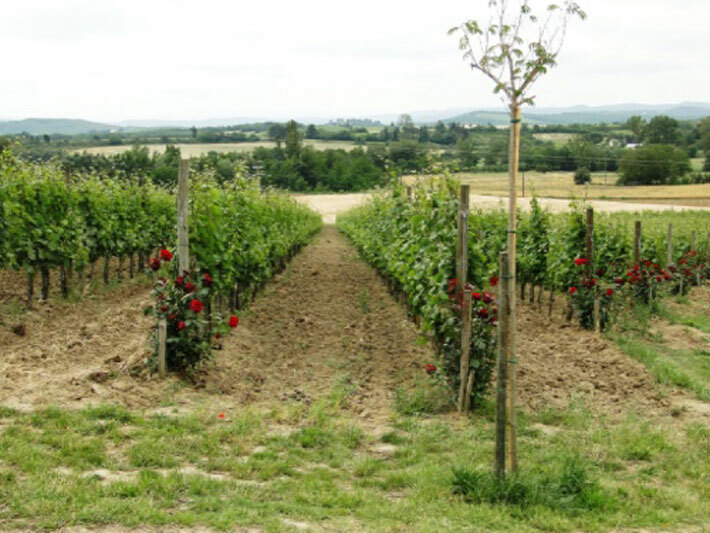 The AOC is, roughly speaking, divided into three distinct terroirs, the left bank, the right bank and a variety of plateaux like the Cordaise (taken from its proximity to Cordes sur Ciel). Like the Cabardes AOC we featured last month, the warm air from the Med and the cooler-wetter airstream from the Atlantic play their part here in Gaillac too. With such a mix of cépages comes a good variety of red & white wines, in addition to the Gaillac Doux which is a lovely acidic sweet white… and not to be outdone by its more famous Beaujolais, Gaillac Premieur is one of the first wines to be launched each year in France and celebrated locally on the third Thursday of November each year. For 2017, we list wines from a family-owned vineyard of Domaine Barreau. Located just 4km from the centre of Gaillac itself, the owners have been involved in wine making since 1865. Their “Traditions” Blanc Sec is a typical Gaillac white with a blend of Mauzac & Sauvignon grapes; the “Ancestral” red is 100% Braucol grape and is a wine that can be laid down in your cellar for a few years. Finally, again from their Ancestral range, the wonderful Galliac Doux which is a semi-sweet wine from three grapes – Loin de l’Oeil, Muscadelle & Mauzac. If you are travelling to La Villa by car and wanted to stock up on a few local wines, ask us for an information about a wine tasting at Domaine Barreau and perhaps lunch in nearby Gaillac where we have a good recommendation too! Next month, we will head SE from Mazamet to the lesser known Faugeres AOC and our newly listed wines from Domaine des Trinities.